We want to begin by saying: Thank you, Thank you, Thank you! Thank you for being here, thank you for the work you do as clergy and laity, thank you for the witness you are in the communities you serve with the love of God we know in Jesus Christ! Last year at this time our grandson Congo was just a couple weeks old and in the NICU at Choc hospital struggling to survive after a very serious surgery. We are so very happy to let you know that we celebrated his first birthday a few weeks ago and he his strong and healthy and the joy of our lives – thanks be to God! We want to thank you for all your prayers, support and love over this past year and are deeply grateful to be a part of this wonderful community of faith here in the PSWR. We are also deeply blessed and privileged to serve as your Regional Ministers. When we reflect back on these past nine years we give thanks to God for all the things we have accomplished here in this Region together with you. As we look forward, we know there is yet much work to do to reach our goals and live into the vision we have for this great Region. We especially thank partners like our Moderator Pam Moore and our Regional Board of Directors who serve on your behalf to guide and direct this Regions ministry. We are also blessed with amazing partners in our Regional Ministry Team of Francisco Ramos who works with our Hispanic ministries, Jo Ann Bynum working with our African American ministries and Young Jun Yang and Young Lan Kim who work with our NAPAD ministries. We give thanks for our amazing office staff, which keeps us, as well as this incredible Region moving forward: Bruce Indermill, Branden Hendricks, Michel Johnson, Janelle Vannoy, Alisa Mittelstaedt, Sarah Bartczak and Keith Clark. In addition we are blessed with wonderful Loch Leven camp staff, under the direction of camp manager Sloan Hamilton. We celebrate our Regional Unit partners Jon Berquist at DSF, Nancy Brink at Chapman University, Matt & Mary Harris at Project Impact, Teresa Palacios at Eastmont, and Sandra Bryant at All Peoples. And of course we could not do this ministry without the work and support of each of you, pastors and congregations of the PSWR! Thank you!! This is why we say; we can do so much more together than we can alone; because we have so many incredible partners on this journey with us. Together we are the PSWR, one church – many members! Speaking of partners, we want to especially thank our host congregations First Christian Church Fullerton and Casa de Oracion Fullerton for their gracious hospitality and welcome! Thank you so much! “This is a busy Region!” and we hear this from pastors and congregations, we hear it from colleagues and we hear it from our General church partners! Yes, there are a lot of wonderful and exciting things going on here in the PSWR! So today we want to share with you some of the ways this region has grown and expanded in the last two years working together with each of you. We came into this position with a deep commitment to our young people and a love for our Loch Leven camp where so many lives are shaped and transformed with the love of God. So living into the vision of expanding the ministry of this Region we initiated a process for evaluating our beloved Loch Leven – its staffing needs, its facility needs, and its sustainability into the future. Thanks to a generous gift from the Wilshire Foundation, on May 2014 we celebrated the grand remodeling of Campbell Lodge at our Loch Leven camp. This improvement provided additional space for a growing outdoor ministry and increasing the usage of our Loch Leven camp. This expansion has significantly increased revenue for our camping ministry. In January 2015 Cathy Perring presented a master plan for future development of our whole Loch Leven camp to the Regional Board for approval. As our outdoor ministry continues to grow we now have a plan for future development that will guide us forward. We hope to build additional meeting and sleeping spaces as well as places for tent and RV camping sites and this is just the beginning. As a part of our development plans, Rock the Loch events have provided a wonderful time of music, food and fellowship, while raising monies and awareness. The next Rock the Loch will event will be May 6, 2017. In addition Loch Leven continues to expand its ministry through grants, in-kind services, volunteers, camp staff interns and more. Most recently we have begun a focused development plan, directed by Sarah Bartczak, to generate additional streams of revenue to support this growing ministry. The Hatchery, still in its infancy, we are celebrating the second year of this new ministry that offers opportunities for new and innovative ministry development in our Region. The Hatchery is becoming a place of teaching and learning for students and for pastors seeking to gain new insights and ideas for strengthening and growing congregations for the 21st century. Building on our commitment as a Global Mission Region, in 2014 we commissioned Paul Turner as missionary to the Congo and established a Global Ministry funding source to support this important work. We will be receiving an offering that will continue this support for Paul and the good work being done on our behalf in the Congo. In addition, in April of 2015 we, along with our NAPAD Regional Staff Young Jun Yang and Young Lan Kim, traveled to South Korea to begin a partnership with the PROK in Kwangju with the encouragement and support of the General Church’s Global Ministries. As a result of this new partnership, in August of 2016 we hosted a youth delegation from the PROK and established a plan for future exchanges in 2017 where youth from our Region will travel to South Korea. The purpose of these exchanges is to be bridge builders in our wider global community and to give opportunity for our young people to deepen their multi-cultural awareness. Our Regional Global Ministry committee in partnership with the United Church of Christ continues expanding relationships in Nicaragua, Cuba, Israel/Palestine, Mexico and Japan. Most recently our daughter Leah Dewey started a 6-10 month Internship teaching English in a primary school in Thailand through our General Churches Global Ministries. Recognizing the changing demographics of our congregations and desiring to further model partnership, plans are underway for relocating our Regional Church offices here on the Fullerton campus. Completion date is scheduled for November 2017. This new location will make the Regional Conference center more accessible for a wide variety of Regional Ministry needs and we are very excited to be sharing space with our two local congregation partners and hosts Casa de Oracion and FCC! Architectural plans are on display in room #107 we hope you will stop in a take a look. We know that a major component for our growing and expanding ministry is in strengthening pastors and congregations for effective ministry. Currently we are working with 50 ministerial candidates and pastors going through the Committee on Ministry seeking Ordination/Standing or Commissioning. Since 2014 your Regional Church through our New Church Development Committee has supported 19 pastors & leaders attending Hope Partnerships Leadership Academy adding to the total of 65 since 2007. This program is designed to develop courageous leaders interested in launching a new church or transforming an existing one. In addition, each year we host a Pastors Gathering and we have held several pastors’ retreats as opportunities for fellowship, education, and networking, recognizing the importance and value of working together. Our next Pastor’s retreat is scheduled for February 24-25, 2017. So pastors, please put this on your calendar. There is a flyer in your packet. In keeping with our Regions commitment to be a Pro-Reconciling/Anti-Racist Church we held Anti-Racism training events in 2014 and 2015 and will co-host another one with DSF in October 2016. These opportunities are vitally important today in the wake of so much racial unrest. In 2014 our Regions Committee on Ministry also adopted the requirement for all newly ordained or commissioned pastors to take Anti-Racism training. To further expand ways to strengthen pastors serving our congregations the Bethany West program was developed in 2013 to support and mentor new pastors in their first call. The Regional Church currently supports 18 pastors who are participating in the Bethany West program. In the last 24 months we have Ordained 11 new Pastors and participated in 13 Installations of Pastors. A list of these can be found on page # in your program booklet. · We have also been committed to strengthening congregations for continued ministry. Currently we are working with 8 congregations who are in pastoral search. Our NCD is working with 24 congregations under care guiding them toward full standing. To date 22 of our congregations, with support from the Regional Church, have participated in Hope Partnerships New Beginnings program – an assessment tool for congregations addressing future directions. We also have had 3 congregations, with support from the Regional Church, participate in Hope Partnerships The Journey program – designed to train and equip leaders for “out of the box” transformation and leadership development. Through our Regions Transformation Committee 5 congregations have participated in the Regions Appreciative Inquiry training. We now have 3 certified trainers who also serve on our Transformation Committee. In 2013 and 2015 we conducted two successful Phone-A-Thon fund raising events for our ministries of Loch Leven and Leadership Development. In the last two years the Regional Church has hosted several Stewardship Education seminars for both pastors and laity to enhance stewardship and generosity in our local congregations. In November 2015 the Regional Church held a Grant Writing seminar for our African-American Convocation pastors and leaders. And in 2014 a successful seminar on Caring for Creation was held to help congregations begin to address environmental concerns and care for the earth. We are excited to be launching a Green Chalice movement to encourage congregations to consider how to care for and conserve our precious resources. There is a resolution at this Assembly on this new direction as a Region. We are grateful to the congregations of Urban Mission, FCC Orange and Pacific Beach CC for leading the way! We currently have 6 properties we are managing where the Region holds title. Several are for new congregations in regionally owned sites where the historic congregation closed, and two congregations where the regional office staff is walking with the congregation to sell the property and relocate. We have sold two facilities in the last 2 years where the region held title and the historic congregation closed and those funds went through a distribution template process to support regional ministries. As a further commitment to strengthening congregations we have also been creating more opportunities for our young people to thrive and grow. In addition to our regular camp offerings: Mini’s, Jr.’s, Chi Rho, CYF 1 & 2 and our two winter camps for Jr. & Sr. High, we’ve added one for children ages pre K through first grade and their parents and/or grandparents called Wee Camp; we’ve also added a camp for youth leaders in our Hispanic communities and a winter camp for our NAPAD youth and young adults. This exciting program is for Sr. High youth who help plan youth events for our Region. The YLT is a community of leaders who spend time together in prayer, worship and leadership development learning how to best serve God, peers and faith communities, regionally and locally. In 2015 we started a new ministry for our young people called the Youth Immersion Ministry, directed by Regional Youth Pastor B.J. Barlow, with the focus on developing Christian advocates passionate about ending racism and equipping them for reconciliation ministry and empowered leadership. In addition we have supported: 16 Youth attending General Assembly; 16 youth on a mission trip to Puerto Rico; 20 youth and young adults on a mission trip to Tijuana, Mexico. As well as 15 youth who traveled to San Jose to participate in the NAPAD Convocation. Plus hosting a dozen youth from South Korea as a part of our mission partnership with the PROK. Recognizing the need for continued support and leadership development for our young adults ages 18-30 we have re-established annual retreats created to encourage and provide fellowship and spiritual growth opportunities for the young adults in our Region. Our Young Adult ministry hosted our First Annual Don Shelton Memorial Mini Golf Tournament – which had 84 youth attending. We celebrate congregations like Abundant Life, East Whittier and Sallims CC and others who have active growing Young Adult ministries. The next Young Adult retreat is scheduled for next weekend, October 21-23 at Loch Leven. Since taking office we have seen overall Disciples Mission Fund giving continue to decline all across the denomination including here in the PSWR. We knew this would be a critical area of support for the Regions ongoing ministry and needed to be taken seriously if we were going to be able to support a growing ministry. We first re-established our Permanent Funds committee to help assess and get a clear picture of our investments for supporting the current ministry. We then explored ways to expand and grow those investments for the future. Working closely with the Christian Church Foundation and our Regions Permanent Funds Committee regular reviews of our investments are done to insure the best returns and use of our resources to meet the ever growing needs of our Regions ministry. We also began creating a long term development plan for ensuring financial sustainability and strong stewardship across the life of the Region. In anticipation of future legacy gifts, the Regional Board adopted a template model for guiding their decisions regarding fund distributions from sales of Regionally owned properties. Each template takes into consideration current needs and ongoing support for our Regional Church ministries. Since 2014 we have awarded well over $1 million in third party grants to our Units, ministry partners, new church projects and seniors in need of financial assistance. Training of church leaders as Fair Election Observers in the Congo; Senior Programs for health and fellowship for siloed seniors; Open Table, a food and community ministry; Beyond Bars, a re-entry program for those formerly incarcerated; Older Adult Ministry Retreat; Youth Immersion Ministry to Puerto Rico; Youth Leadership Team to the National Youth event in Florida; Young Adult Retreat; Immigration Resource center; Homeless support program; Grant Writing Workshop; NAPAD youth and Young Adult Winter Camp; The Regions NBA XPLOR Program and so much more. In the last two years we have also distributed over $22,000 in Camile Grants for: 3 food ministries; 2 Family Promise ministries; 3 ministries addressing poverty and homelessness and others for training leaders to address these issues. In the last two years we have distributed over $13,000 in Reconciliation Grants as well as awarded numerous Leadership Grants. We continue to support our Annual Don Shelton Memorial Golf Tournament where $ raised go to support our 5 Ministry Units. Beginning this year we are launching a new broad based and consolidated development plan for strengthening and growing our overall stewardship in the Region. This plan is called “Honoring the Legacy – Building the Future.” Sarah Bartczak our Resource Development staff will be directing this important part of our ministry. You will be hearing a lot more about this exciting new plan as we move into the future. Early in our regional ministry we gathered a core of leaders representing the diversity of the Region to help identify goals that would direct our Regions ministry. We selected four that seemed to capture the imaginations and passions of that team of leaders. This vision has influenced all the ways in which we have sought to do ministry throughout the PSWR. It has impacted how we select leaders to serve on our Regional Board, on our committees, on how our camps are structured and developed and so much more. We also made a commitment to expand our staffing particularly in our work with our constituency groups. The Regional Church supports our three constituency groups: Convención, Convocation and NAPAD and celebrates these important ministries. Rev. Sung Do Ee serves as president of the Korean Convocation. In the last two years our NAPAD staff have written curriculum for Anti Racism and Boundary Training as well as Disciple History and Polity in Korean that is culturally based. Many Pastors have taken these courses to meet their Standing requirements. The Korean Convocation meets regularly for fellowship and hosts both educational activities and fellowship celebrations for the Pastors and lay members; as well as retreats for pastors. Bishop Larry Taylor leads our African American Convocation and they have held several exciting events in these past two years, including a Prayer breakfast with Rev. Cynthia Hale and a retreat with Rev. Dr. Frank Thomas. In addition they supported the 30th Anniversary Celebration of Project Impact and the Black Lives Matter movement at McCarty Memorial CC. Newly elected president Delmy Amaya works with our Hispanic Convención to provide oversight with quarterly meetings for this growing ministry. They have a committee on ministry team that works closely with the Regions Committee on Ministry to help guide pastors seeking ordination and/or commissioning. They have held pastors retreats and hosted our National Hispanic gatherings. In addition they support youth events and camps that often have well over 100 youth attending. Rev. Francisco Ramos as Director for Hispanic Ministry – now a half time position; Rev’s. Young Jun Yang & Young Lan Kim now share a full time position; Rev. B.J. Barlow has joined our staff as full time Director for Youth and Young Adults; Tanya Lopez has now come staff as Director of Disciple Women’s Ministry; Alisa Mittelstaedt has been brought on as Communications Coordinator and Sarah Bartczak now heads stewardship emphasis as Resource Developer. Recognizing the expanding role and responsibilities of several our regional ministry team pastors, the Personnel committee and Regional Board have supported our recommendation to name: Rev. Dr. JoAnn Bynum, Director of African-American Ministry; Rev. Young Jun Yang and Rev. Young Lan Kim Directors of NAPAD Ministry; Rev. Francisco Ramos, Director of Hispanic Ministry and Rev. B.J. Barlow, Director of Youth and Young adult Ministry as Associate Regional Ministers of the Pacific Southwest Region! We were pleased to be a pilot Region hosting a NBA Xplore House, which was launched in 2014. Now in its third year, and we want to thank the folks at FCC North Hollywood who have hosted this program and given significant leadership in its development in the Region. FCC Pomona; Casa de Oracion; FCC Fullerton; FCC N Hollywood; McCarty Memorial; FCC Santa Barbara and at the Regional Assembly. You can see the words on the left from the WORDLE created from all the reports that went into the General church after these events. There are a lot of words on this page that represent the conversations we had around the region. The largest words reflect the conversations that were lifted up the most in the Mission First Gatherings. We heard conversations about teaching and caring, reaching out and loving, disaster relief, justice, social media, compassion, youth and family services. 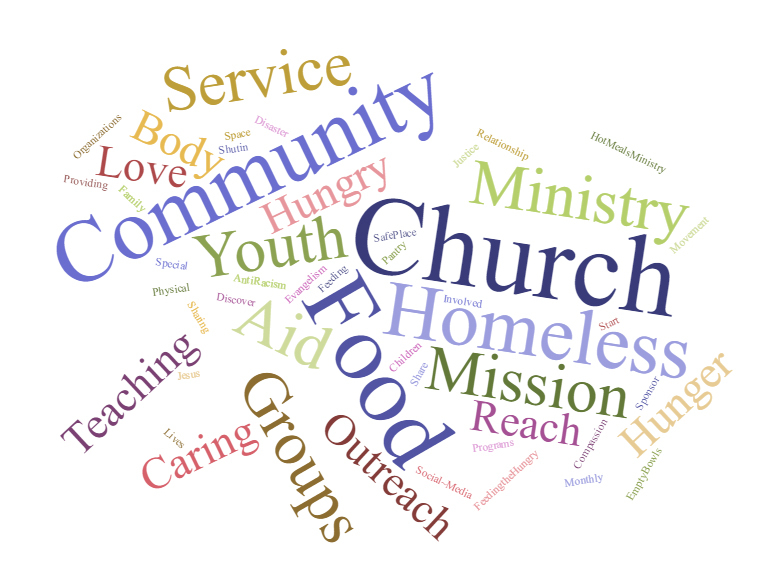 The most significant words noted are Church, Community, Food, Hunger, and Homeless. The conversations we heard every where were about finding ways to reach beyond our church doors and partnering with the community and finding ways to address these issues in our communities. So we will invite the region to move forward in two areas. · Learn about “Housing First” models of meeting the need of homeless in our cities. · Helping one another so that every congregation large or small is doing something to address the issues of hunger and food insecurity in our region. So many congregations are already doing something, food banks, weekly hot meals, community gardens, summer lunch programs, but this was such an overwhelming focus from our conversation that we would like to make this a region wide commitment with congregations asking one another “how we can help you do this too” or “how we can do more together”. These are projects that Vision Funds can and have supported when two or more congregation work together, because two congregations together are the Region. And we would like to gather people together to take the next steps to work on the systemic issues of hunger and do more than treat the symptoms, but change the systems. We are excited to share that the NCD committee has prepared a proposal to intentionally plant and support new churches over the next 4 years living into our General Churches 2020 vision. Most of our new church growth has been through congregations affiliating. This proposal will take into consideration the diversity needs of our Region as well fresh approaches in ministry. We are pleased to be recognizing Sallims CC as a new church in full standing at this Regional Assembly. We continue to provide support for transformation programs for existing congregations seeking to reimagine their ministry for the future. In 2016 we will be offering Transformation grants up to $1000 to congregations seeking support for new ministry proposals. When we first took office all our financial accountings were handle by the Regional bookkeeper. In the last 9 years our financial position has drastically changed and we have been moving through a series of transitions to keep pace with our growing needs. In 2015 we acquired new financial software and data management software to address the expanding complexity of the Regions financial portfolio and to provide more efficient and clearer financials for our Regional Board of Directors. In 2015 we also hired Keith Clark as Financial Officer to direct the transition from our previous financial accounting to the new system and serve as financial consultant. We are nearing the completion of this transition and will be excited to share the changes beginning in 2017. As a part of our growth and continual transparency we have adopted new protocols for annual audits that are presented to the Regional Board of Directors by our auditors. In anticipation of our move to Fullerton and for better safekeeping we are now beginning to move our record keeping to a digital format. These are just some of the ways together with all of you we have been growing and expanding the ministry of our Region. As most of you know our term will end in September 2019, just three short years away. Soon (Early in 2018) plans will start for the process of selecting new Regional Ministers to continue the work we’ve done together. What do we hope to accomplish by 2019? We hope that together we can find more ways as a Christian community to let our voices be heard as we speak into the concerns and conflicts facing our culture, giving bold witness to the Good News we know in Jesus Christ. We hope to continue to train and educate ourselves as the body of Christ to be bridge builders so that we can move past the cultural and racial barriers that attempt to divide us as one human family. This Region continues to be a wonderful model for our whole church and yet we know we still have a long way to go to be all God dreams for us to be. We will continue to give guidance as we move the Regional Church Office to the Fullerton campus to be a Regional Ministry center. Working with our Camp & Conference Committee, our Regional Youth Staff and others we hope to develop a comprehensive program for recruitment of campers, counselors and directors for our camping ministry. In addition we hope to expand our endowment for Camp Scholarships so that any young person from one of our congregations can afford to attend. As a Region we want to continue being on the cutting edge in exploring creative and innovative models for developing new ministries. And there is that challenge to do at least one thing in addressing the concerns for food insecurity and homelessness in our communities. We also want to continue to focus Regional resources on educating, training, and preparing our lay and clergy leaders for ministry in the 21st century. There is a great deal of ministry yet to do, but we have a strong foundation for the work of the next 3 years. We are well situated financially as a Region and we have great staff and excellent leaders for the work ahead. None of this would be possible without the prayers, support and dedication of all of you who make up this great Region that we are privileged to serve. So let us close by again saying THANK YOU for being amazing partners on this journey. Together WE ARE THE PSWR!